This panel allows for the creation, deletion, and customization of Roles within Innoslate. Here we see the standard four roles: Owner, Reviewer, Viewer, and Collaborator. 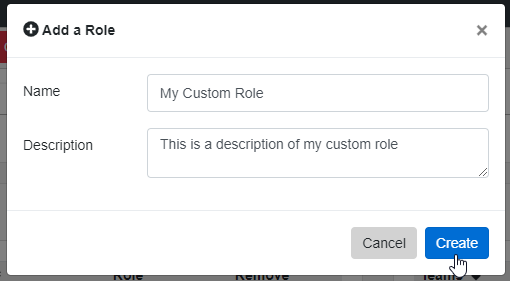 To add a new role, select the “add Role” button shown above, then a simple dialog with the name and description of the role will be provided. You can adjust any of these roles by clicking on them. This will open the Roles Dashboard. See Manage Roles below. To change these permissions for the role, select the “Edit” button. You can then uncheck or check the permissions and then update those values. Once you create the role, you can assign permissions using the role panel shown above.